Kansas City is often seen as a mild-mannered metropolis in the heart of flyover country. But a closer look tells a different story, one with roots in the city-- complicated and colorful past. The decades between World Wars I and II were a time of intense political, social, and economic change--for Kansas City, as for the nation as a whole. In exploring this city at the literal and cultural crossroads of America, Wide-Open Town maps the myriad ways in which Kansas City reflected and helped shape the narrative of a nation undergoing an epochal transformation. During the interwar period, political boss Tom Pendergast reigned, and Kansas City was said to be "wide open." Prohibition was rarely enforced, the mob was ascendant, and urban vice was rampant. But in a community divided by the hard lines of race and class, this "openness" also allowed many of the city's residents to challenge conventional social boundaries--and it is this intersection and disruption of cultural norms that interests the authors of Wide-Open Town. 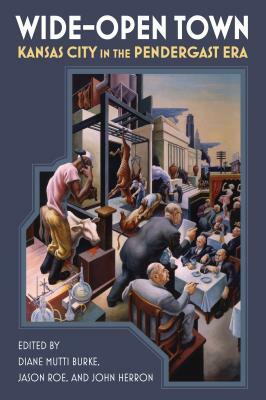 Writing from a variety of disciplines and viewpoints, the contributors take up topics ranging from the 1928 Republican National Convention to organizing the garment industry, from the stockyards to health care, drag shows, Thomas Hart Benton, and, of course, jazz. Their essays bring to light the diverse histories of the city--among, for instance, Mexican immigrants, African Americans, the working class, and the LGBT community before the advent of "LGBT." Wide-Open Town captures the defining moments of a society rocked by World War I, the mass migration of people of color into cities, the entrance of women into the labor force and politics, Prohibition, economic collapse, and a revolution in social mores. Revealing how these changes influenced Kansas City--and how the city responded--this volume helps us understand nothing less than how citizens of the age adapted to the rise of modern America.